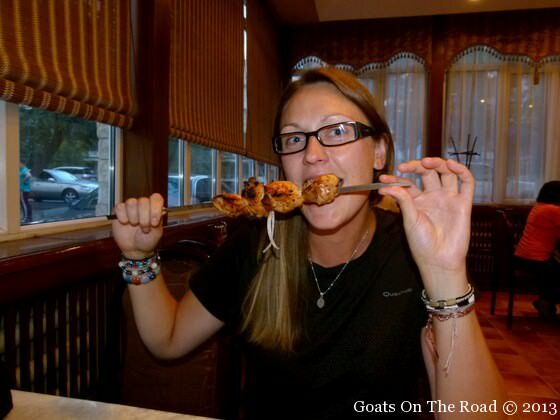 Goats on the Road Posts » Travel Blogs » Asia » Central Asia » Kazakhstan » Almaty To Bishkek: Goodbye Kazakhstan, Hello Kyrgyzstan! After an amazing 10 days in Kazakhstan, it was time to say goodbye. 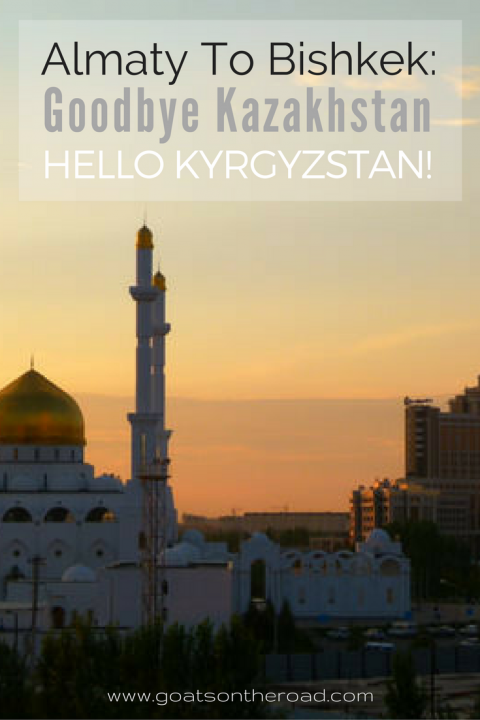 We had planned to see more than just Astana and Almaty, but after having some fast-paced travel days, we decided to just stay put and travel slower. We spent a whole week just in Almaty and had a great time there. We did so many things and learned a lot about the country from our new Kazakh friends…we actually could have stayed longer! 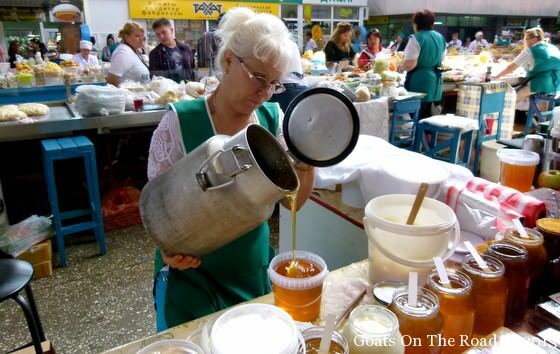 Our day spent at the market in Almaty was amazing…as was this fresh honey! The morning of our departure, we took a city bus to the long-distance bus station where we boarded one of the many marshukas (shared mini-vans) bound for the capital of Kyrgyzstan, Bishkek. The ride started off ok, but after a short break for lunch, we were all shuffled into a different marshuka. Our backpacker mentality kicked-in and we both automatically said “no”. We’ve seen the scams before, you pay the full price to one city and switch buses mid-way where they expect you to pay more money to get to your final destination. But since everyone was moving their bags over (all local people) we decided to just go with the flow and follow along, either that, or be stuck at the dusty, middle of nowhere stop. Our new marshuka was older, louder and much shitier (is that a word?) Nick and I were sitting in the very front seats of this mini-bus and the engine started to overheat. It was cranking out extreme temperatures from the air vents, directly into our faces. Our entire bodies were sweating; opening the window didn’t even help because the air outside was over 30 degrees. We were crawling along the highway at about 50kms/hour. Finally we arrived at the border. Before starting on this trip, we had read (and been told) that citizens of most western countries don’t need a visa for Kyrgyzstan, we just receive a stamp in our passports on entry. When we got up to the counter, the passport control was flipping furiously through our passports in search of something. We both looked at each other knowing what he was looking for. He finally gave up and said: “You have a visa for Kyrgyzstan, yes?” Um, “No, we don’t need one” was our reply. 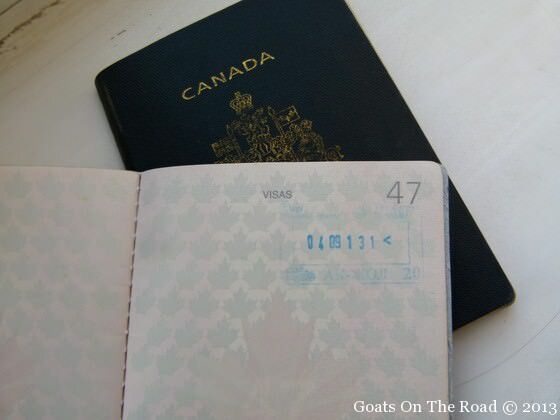 He went asking around to his colleagues and lucky for us, our research was correct and he stamped us out of the country – surely the passport control should know this though and not have to be told by a couple of Canadians! 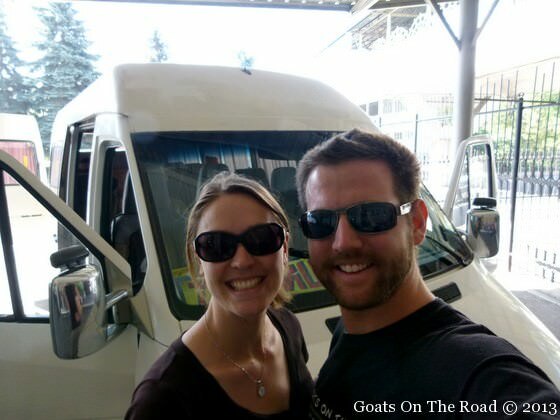 Luckily we were able to get our visa on arrival at the border! We continued to walk about 1 km to Kyrgyzstan and were stamped in with no problems. We then had to wait for our marshuka to take us to Bishkek. We people watched, drank some water and stood around in the shade waiting for our bus, or anyone that we recognized from it for that matter. After about a 1/2 an hour we started to think we had been left behind. We walked back to the border area to look, we were scanning the people but recognized no one. Then we spotted him! He had just taken longer to go through customs with the vehicle than we had…phew. We waved at him with huge smiles on our faces, but he just looked right at us with a blank stare and drove about a kilometer away where he pulled into a gas station. Oh good, he’s just fueling up we figured. So we hoofed it there, lugging our bags on our backs in the scorching sun (swearing at him for not picking us up along the way). Just as we were arriving at the gas station, we saw our white minivan peeling out of there as fast as possible. It was official, we were being left behind! 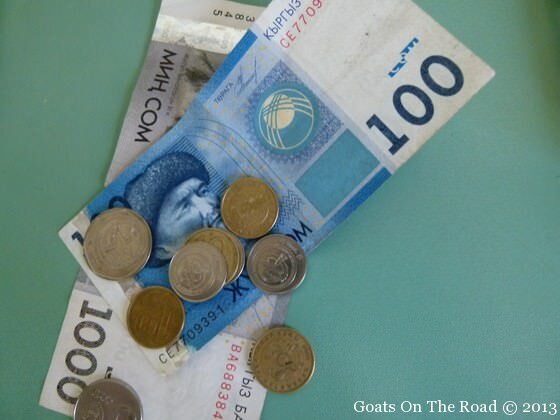 We had a little bit of local currency that we had exchanged at the border so we decided to flag down the next minibus or car we saw and ask for a ride. Within a couple of minutes, a local bus that runs from the border to Bishkek pulled over. It was only going to cost us 50 cents to get to the city. Luckily we had enough and hopped in. We spent two nights in Bishkek at Silk Road Backpackers. A husband and wife team own this one and the hostel that we stayed at in Almaty. The hostel was ok, we at least had a double room and didn’t have to endure sleeping in a dorm room…but like a few other places we’ve stayed on this trip, the door to our room didn’t lock. 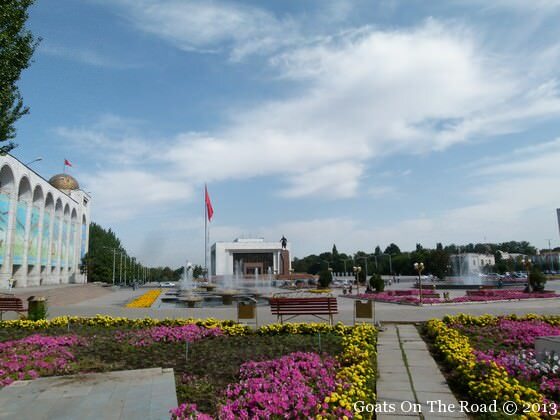 We spent our time in Bishkek wandering around the leafy streets, eating some amazing local food, applying for and obtaining our Tajikistan visas (yay!) and just chilling out. Bishkek was an alright city, we had heard it’s basically just a place to eat good food and to apply for some of the many visas a traveller needs in this part of the world. We thought it was a nice stopover, but knew it was just that…we wanted to get to stunning Lake Issyk-Kol as soon as possible! Have you ever been ripped off when taking transportation? Tell us about it below! In Almaty – Take bus number 45 from along Dostyk Ave. to get to the Sarayan Bus Station (Long Distance Bus Station) the cost is 80KZT, taking about 30 minutes to get there. Marshukas from Almaty to Bishkek run from early in the morning until the evening, leaving when full. The cost is 1,300KZT and it takes 5 hours to get there. 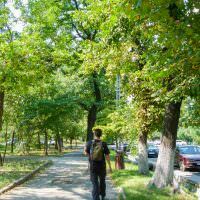 FROM THE LEAFY STREETS OF ALMATY: ARE WE IN KAZAKHSTAN? Sorry to hear you got left behind – I’ve taken marshrutkas across borders throughout the former USSR and have never had that happen. Crazy! (although I actually took a shared taxi from Almaty to Bishkek – a little more comfortable!). 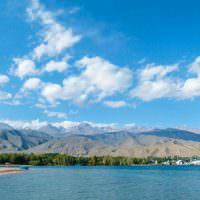 Enjoy Isskyk-Kul – Karakol is great, as is Bokonbaevo on the south shore. Nice yurt camp to stay at right by the lake shore that can be arranged by the CBT there. Hey Katie, thanks for the heads up on the spelling! We had a great time at Issyk-Kul and Karakol, did some awesome trekking around there. Posts to follow! …well, we were left behind, just like you guys. But at least we came prepared after reading your blogpost. We took a taxt and went on a marvelous horse riding tour the day after. Best wishes! no way! What a scam they have going on at that border. I’m glad you were prepared for it and had such a great day of horse riding! Dear both, nothing surprising about border crossing between Almaty and Bishkek. The Marshrutka price corresponds to the fare till the border. Once crossed the border, you are 10 km from the centre of the City, and you have a lot of taxis or buses waiting for you for a very tiny fee to to rejoin the city center. You have the same at the west ofr Kyrgyzstan between Talas (KG) and Taraz (KZ). The reason is the cars and buses take a lot of time to cross the border and it is quite quicker to cross by foot. And then find another bus to continue. Planning for a vaction in krygstan and read lot of beautiful places but cant hike for long ….just a samll hike for 2-3 hrs ,,would it still be nicer to visit krygstan or skip as cant do long hikes to see wonderful lakes or glaciers ….how about the month of may ? There are shorter hikes that you can do in Kyrgyzstan, but there are also many long ones, and many that are high altitude. You could do a hike around the village of Arslanbob! That’s a beautiful place, with shorter walks. You could also do a horse riding trip! Enjoy. was taking the private car from Almaty to Bishkek in Dec 2015. cold , dry and all white outside the window all the way.. definitely must go again in summer. – ashgabat – turkmenbashi -(boat) – baku – istanbul – london – usa. Hi, do you know roughly what time the first marshrutka leaves from Almaty? We want to get one as early as possible as we will only be in Bishkek for a day. Does anyone know roughly when the last one leaves from Bishkek?